This is my sixteenth Purana review. It is a satvik Purana, so it concentrates more on Vishnu and glorifies him in his Varaha avatar. The Varaha Purana comes twelfth in the list of Mahapuranas. It has twenty-four thousand shlokas so it is medium sized in length. These shlokas are divided into two parts – the purva bhaga and the uttara bhaga. 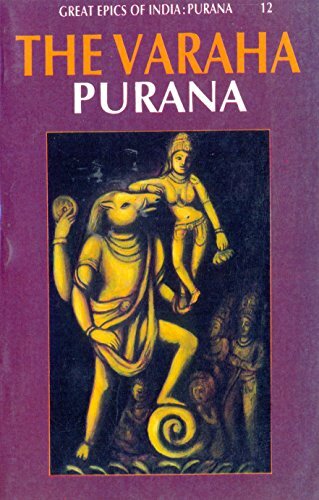 This purana is named so because it was narrated by Vishnu in his varaha avatar to the earth (prithvi). Prithvi had many questions and was also curious to know the powers of Vishnu and who he really was. In answer to these questions Vishnu narrated this Purana. This Purana talks about rituals, sacrifices, fasts and major tirthas in detail. It also talks about the 35 ways in which varaha or a boar is connected to sacrifices and the Vedas. Now let us move on to my favourite stories. There were lots of different stories and many of them were new to me and I hadn’t heard of them before. But these two were the ones that I liked the most. As you know, most of the Puranas are narrated in the naimisharanya forest by Lomaharshana. The story below talks about why the forest was named thus. There once lived a king named Durjaya. He had obtained a boon from Durvasa that made him invincible but hard-hearted. Durjaya conquered the world. One day, along with his army he stopped at the ashram of the sage Gouramukha. Now, you must be wondering how could one sage get food for a huge army, right? Well the sage had a jewel named Chintamani which could provide anything you wanted. The sage just wished for food and it appeared. There was so much food that the whole army ate happily. Now, Durjaya saw this and wanted the jewel. The sage refused to give it, so the king sent his whole army to bring the jewel. Chintamani produced many more soldiers to protect the sage. The sage’s army defeated Durjaya’s. Both of the king’s father-in-laws sent their armies too, but Gouramukha called Vishnu who killed all of them including Durjaya. The time taken to blink is called a nimesha. As Vishnu destroyed the whole army in a nimesha the forest where this happened was called naimisharanya. It is said Vishnu always resides there. I found this story very interesting and loved it. I have given it in a summarized form because it was slightly long. I finally found out why the famous Purana setting was called naimisharanya. I didn’t know the reason for this was a war between a sage and a king. This was my first favourite story in the Purana. My second favourite story is given below. This story is about a holy tirtha. There once lived a king named Vishala who was unhappy because he didn’t have sons. He was advised to go to the tirtha of Gaya and offer oblations to his ancestors. Vishala did it and three beings appeared in front of him. The first one was white and the other two were red and black. The white being was his father as he had never committed any sins. The other two were his grandfather and great-grandfather. They had performed sins, so they were suffering the consequences now. Once he offered the oblations to them they were freed. If you offer oblations to your ancestors there, then your ancestors are freed immediately. Gaya is a very holy tirtha and you should go there if you want to free your ancestors. This Purana also describes the tirtha of Mathura in great detail. It is said to be the holiest of tirthas because Krishna lived there. It is said that Vishnu’s footsteps are present everywhere in Mathura. Any resident of Mathura always gets the desired benefit because it is very holy. Like Gaya if you perform the oblations in Mathura your ancestors get freed immediately. If you walk around the whole of Mathura on foot you get lots of punya. Some holy places in Mathura are Madhuvana, Kundavana, Kamyakavana, Mahavana, Vrindavan, etc. I would love to visit this place sometime. The different types of hell and Yama’s abode is mentioned too. There are also some precautions. One of them was to never worship Vishnu while wearing red, blue or black clothes. This was useful as I can now take care of it in future. You should not touch or worship Vishnu’s idol if you are wearing unclean clothes or have come back from an unclean place. You should be calm and not touch meat or wine if you want to worship him. If you do not follow this, you are sure to go to hell(naraka). Lastly, let me describe the virtues of this Purana. The Varaha Purana is also very holy. It pleases Narayana and cleanses you of all sins. You get many sons and grandsons if you read this Purana. You obtain a lot of punya if you read even one chapter. This is a Purana that is full of virtues and it is very interesting.